I'm backing up my mac from a Hard Drive that someone gave to me, but I don't have enough space on my Mac. How I can delete files that I don't need to be backed up (when I try to delete it says The operation can’t be completed because backup items can’t be modified) from the HDD so backup wont be corrupted and I can backup my Mac? By removing things like Applications folders and cloud storage services like Dropbox, OneDrive and Google Drive you can save a lot of space. If this still isn't working you need a bigger drive to backup to. Not the answer you're looking for? 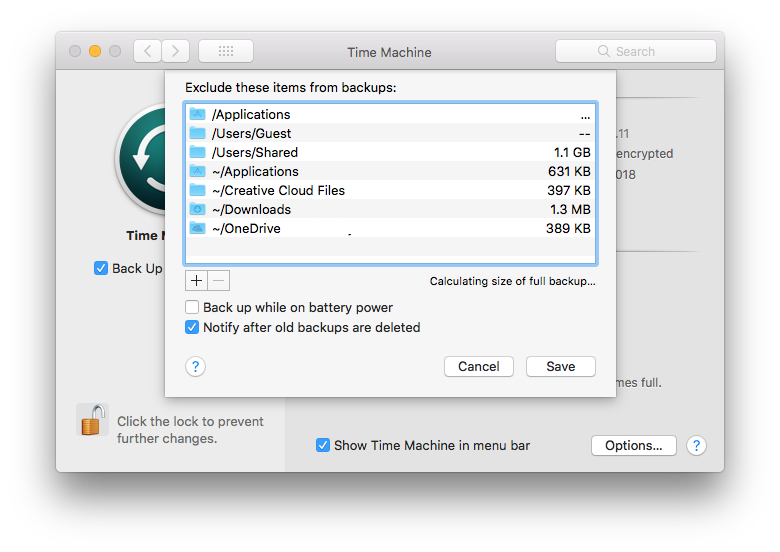 Browse other questions tagged macos mac backup time-machine migration-assistant . How can I delete a file marked as backup item? How to recover a deleted folder from Time Machine back-up disk? How do I restore an iPhone from a backup located on an external drive?